Samanayrs • View topic - If you were new to Samanayrs.. If you were new to Samanayrs..
Post subject: If you were new to Samanayrs..
..what information would you have wanted? Post subject: Re: If you were new to Samanayrs..
Hmmm... I know the naming rule was a little confusing for me at first and the Songs but other than that I don't know what info would be good for newbies. Ooh, can't wait to see this when its done! Sounds neat. Can't wait to see!! Looking good! And you're definitely better at folding those than I am. XD Hopefully they'll help bring some new people in! that are community developed. There are guest artists and event runners and Sushi is always looking for and paying attention to feedback. Samanayrs (SAH-man-airs) are what's known as a virtual pet, or adoptable. They're part roleplaying game, part collectable, and part cute original art, not to mention a lot of fun! Each one has unique art and is hand-colored, and with almost 200 traits and more than 20 species there's a lot of variety to be had! All Samanayrs are one-of-a-kind individuals and come with a name and ID number and more than 2000 individuals have been created. When you adopt a Samanayr it becomes your virtual pet, or character, and you can use it to enter events and interact with other peoples' Samanayrs through the forum. So, how do you adopt? Events are held regularly on the forum for chances to win free Samanayrs. Customs and Samanayr cards are also occasionally available for sale at conventions and online. You're welcome to be as involved in the community as you'd like, and there's no minimum activity requirement. Your Samanayrs will always be yours, even if you take some time away! How does the adoption process work? It's pretty easy! 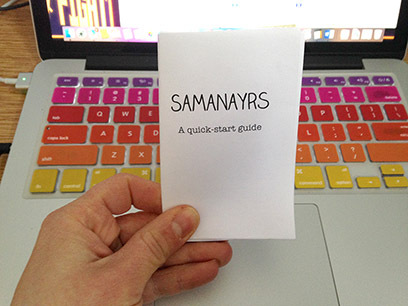 Step 1 - Enter events, draws, and contests until you win your very first Samanayr! Events range from random draws where you just have to post to enter to more complex events that could require writing, drawing, or even cooking. Alternatively, you can purchase a Samanayr card at a convention! Step 2 - I'll update the Samanayr's cert* with your name. That's it! The Samanayr is now yours to play with. In a week or two the Samanayr will be added to the database, which will then show you your Samanayr's traits in addition to the information shown on its cert. There's two main types of items - equippable and consumable. Equippable items are items that can be worn by your Samanayr. They may have an effect, or just look nifty! When you equip an item to a Samanayr I actually draw it and add it to your Samanayr's image. There's a number of consumable items (also known as one-use items) which can be used for things such as trading for different types of items or influencing the features of a foal from a breeding. Items are added to your database account. While logged in on the site you can go to Members - My Stuff to see your inventory. You can also go to Database - Inventory to see everyone's items! For more information on the different types of items, please go to the Expeditions page on the site. Breeding is a big part of Samanayrs, and also a lot of fun! You can breed two Samanayrs together to create a foal whose traits, colors, and patterns reflect that of its parents. To breed, the parents must be in the same Song, or breeding group. If you don't have any Samanayrs or don't have any in a Song, you can also find open Songs that don't require permission from the owners to apply with. Each breeding generally has a 30% chance of success. Foals inherit their traits and colorations from their parents, but items can also be used to do everything from determine the foal's gender to changing its species. There's also a small chance for twins, or even triplets! Full breeding seasons, where many breeding slots are available, happen once or twice a year. Sometimes the monthly draw is for breedings, and they can also be purchased as customs. For lots more information on breeding and Songs, please go to the Breeding page on the site. Samanayrs are able to adopt pets of their own! There's a wide variety of pets, from small intelligent dragons to large protective canines. Pets are available as prizes in events and can also occasionally breed to produce new pets. When you win a pet, it's added to your database account. You can choose to equip it to a Samanayr and name it, but neither is required. When a Samanayr adopts a pet, the pet's image appears with the Samanayr on the Samanayr's cert and is equipped to the Samanayr in the database. Here's some of the other events and activities that take place on the forum! Races occur regularly on the forum. You can enter a Samanayr (or borrow one from another owner) in the race and watch as they compete for prizes and glory! Samanayrs can go on Expeditions to find tradeable items. Expeditions are either random events or RP-based. If you have enough tradeable items and the Job Fair is open, you can get a job for one of your Samanayrs! Samanayrs with jobs receive a set of accessories for their uniform and special abilities, depending on the job. I try to hold a free draw every month. The draw can be for customs, semi-customs, breedings, or more! 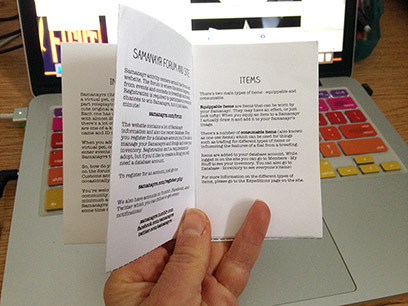 Samanayr activity centers around the forum and website. The forum is where the action happens, from events and contests to breedings and races. Registration is required to participate in events for chances to win Samanayrs, but it just takes a minute! The website contains a lot of Samanayr information and also the owner database. When you register for a database account you'll be able to manage your Samanayrs and Songs and view your inventory. Registration isn't a requirement to adopt, but if you'd like to create a Song you will need a database account. We also have accounts on Tumblr, Facebook, and Twitter which you can follow to get event notifications!